The vehicular video-conference system is part of the MOD encrypted VTC system providing data, voice and video communications, between two or more subscribers in the battlefield. 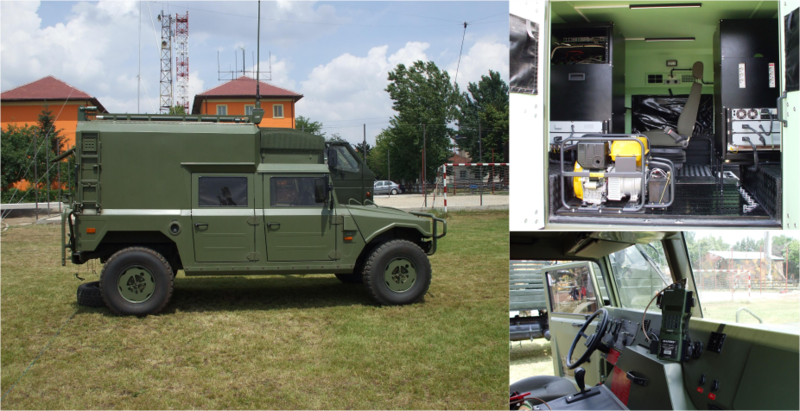 A TT URO, VAMTAC four-wheel drive vehicle provides the common mobile platform for the communications system. Equipped with wireless equipment providing a minimum of 1 Mbps between two vehicles or between a vehicle and MoD infrastructure network (RMNC). The system is equipped with RF-5800V, FALCON II series radio that provides advanced capabilities for secure high-speed data and digital voice operation in both fixed and ECCM modes. The system supports VHF voice and data communication while “On-the-Move” or while deployed in a “Static” location. Due to the security reasons, all black and red cables and the equipment are separately installed according to military standards.